There aren't many ancient Maori kites still intact today. Just a few special ones, in museums. For example, a 4 meter (12 feet) wingspan sacred kite which is housed in the Auckland Museum. However, New Zealanders are rediscovering their kite-making roots now. Interest is growing, and workshops are sometimes held where anyone can learn how to make Maori kites using traditional techniques. Birds and kites are very closely associated in Maori culture. Hence the Maori names of their kites usually include the word 'manu', which means 'bird'. Some other Maori names for kites are 'kahu' meaning 'hawk', and 'manu pakau' which means 'bird's wing'. Maori kites are an ancient form of kite so named because they were first made by the indigenous people of New Zealand, the Maoris. These people chose to make many of their kites in the shape of a bird. 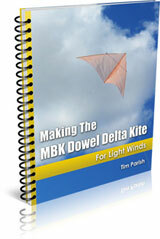 Making The MBK Dowel Delta is a printable e-book. It's a PDF file download. First, some general points about the oldest bird-like kites. Like most things Maori, they often displayed flowing patterning, carving, and decoration. Frames were made from light wooden rods and tree twigs lashed together. Some ancient Maori designs were actually triangular in shape like modern Deltas. See the photo, supplied by Robbie Whitmore, from the kites section of her New Zealand in History website. Used with permission of course! Some of these kites were quite large and flexible, and must have been quite an experience to watch, with the flapping or swinging movement of the wings in the wind. In a similar way to modern Western kites, streamers were often used too. Flax and feathers though, not plastic or ripstop nylon! Also, cockle shells were sometimes fastened to the kites to produce a rattling noise. Now that's not seen on any other traditional kites I know of! However, the idea of letting kites make some noise was also used by the ancient Chinese. Some of their kites were fitted with taut strings that vibrated and hummed in the wind. Also, some modern kite flyers like to attach whistles to their kites! Another accessory of the ancient Maori kites was a 'karere', or messenger, which was made of bark or other light materials. This was sent up along the flying line towards the kite, its purpose being to communicate with the gods. In contrast, sending stuff up the line or attaching it at various points is merely called line laundry at kite festivals in other parts of the world! Even though much of the Maoris kite flying was very serious business, their kids must have pestered them for a kite... Has anything changed? :-) So, it's not surprising that researchers have found that smaller, cruder kites were indeed made for the kids to fly! These kites had no tails or streamers. The flying lines were simply thin strips of flax knotted together. Maori kites and culture were closely intertwined. 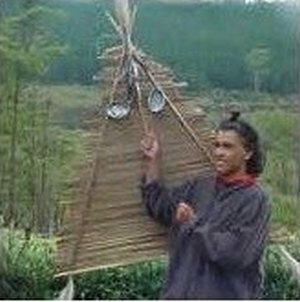 Only a 'tohunga' or priest could make a sacred kite, and it took quite a lot of time and effort. Kite flying was a ritualistic practice. Kite making was associated with the god Rongo, who was said to be a great patron of the arts, and the god Tane, who was at times pictured as a kite. Rehua, the highest of Maori gods was also linked to kites and was referred to as 'the sacred bird' and was even considered to be the ancestor of the kite.